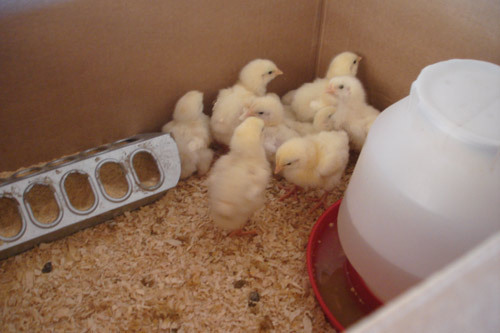 You are currently browsing the Suburban Homesteading – Frugal Living blog archives for June, 2012. California Bountiful is a monthly publication sent out by Farm Bureau to FB members or to people who have insurance through the FB providers. It’s a great snapshot of what is going on in California Agriculture and for the past few years they have been concentrating on the upsurge in smaller sustainable farms, unusual crops and niche industries that are building up in response to a generation of new farmers more interested in sustainability, non-commercial varieties of crops, pasture raising and smaller high quality production of value added products than their corporate farm counterparts. Some day a bright young thing working in a basement lab using cheap hardware store parts might come up with a better way of obtaining free energy, but until that time comes clotheslines are the next best thing! IN THE MEANTIME…LET’S CELEBRATE — The first week in June is International Clothesline Week and was created to encourage people to hang their clothes on a line to dry instead of using electricity or gas sucking clothes dryers. For nearly 10 years, thousands of people and communities worldwide have participated in International Clothesline Week, and many communities have revised their regulations to allow clotheslines. Now that’s what I call changing the world for the better! 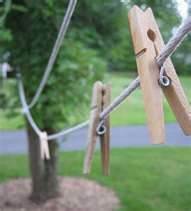 Do you remember your mom hanging clothes out to dry? Do you remember seeing all the bright colors flapping in the breeze? Can you smell the fresh spring day while taking them down? Even in winter clothes were hung out to dry, sometimes coming in so frozen they could stand on their own. Now most people use dryers exclusively and world-wide that adds up to a lot of dryers! Opt for Breeze Power, Sun Power, HUMAN Power! Did you know…Over 80% of households use a clothes dryer, drawing huge amounts of precious energy! If every household spent even one day hanging their clothes out to dry it would save a huge amount of energy and equal a huge savings in dollars. More importantly less dryer use translates into fewer pollutants and fewer health consequences associated with coal driven electricity.